I created this recipe for my birthday celebration back in January, where I also served my Cranberry Cardamom Coconut Cookies. I held on to this recipe until now, as I perceive carrot cake to be a more summery dessert. 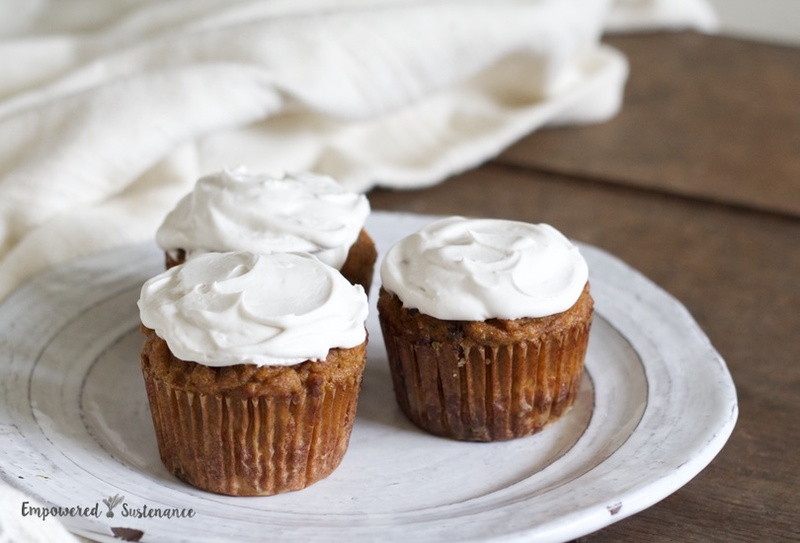 Feel free to leave off the coconut frosting and call these “carrot muffins.” They are moist without being dense, and aren’t overly-sweet. Plus, it doesn’t get easier than the “just mix all the ingredients together in one bowl” preparation. Coconut flour requires recipes specifically formulated for its unique baking properties (like this recipe!). It tends to absorb a lot of liquid and requires more eggs than other grain-free flours. No other flours can be substituted here. Eggs play an integral role in binding baked goods with coconut flour. Eggs substitutes will not work. 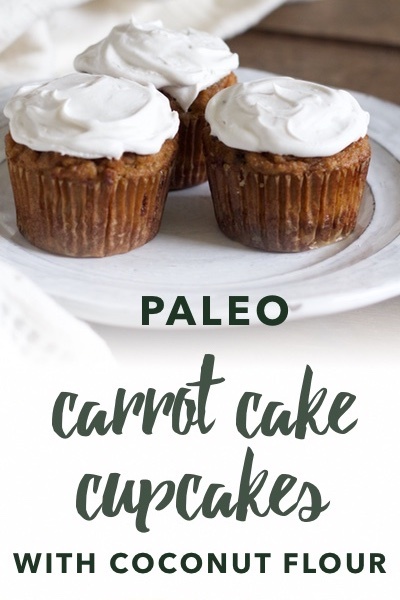 Finely shredded carrots are the secret to light, not dense, carrot cake. This is a tip I learned from a professional pastry chef. 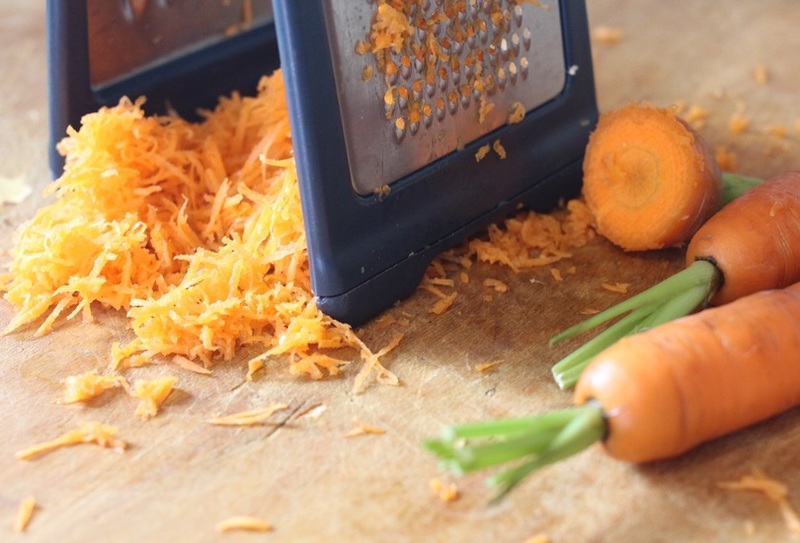 So make sure you use the fine side of your box grater, as shown below, to prepare the carrots! 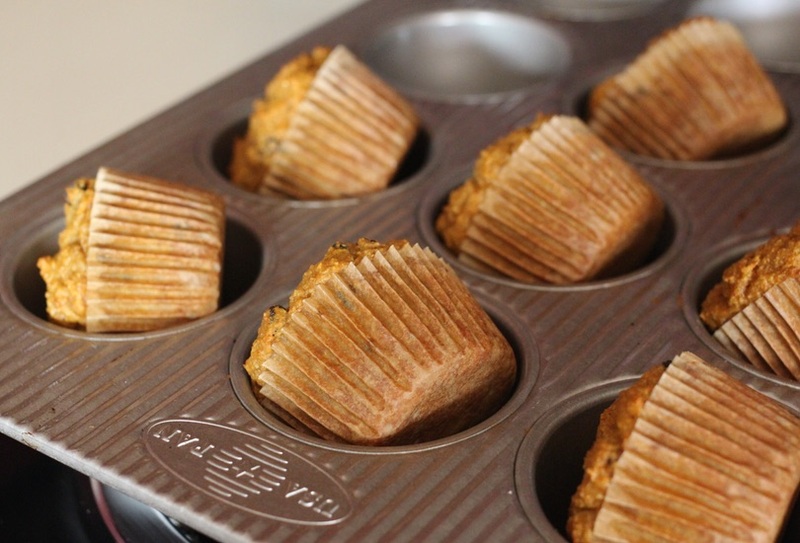 One more tip: As soon as you take the cupcakes out of the oven, tip them sideways in the muffin pan as shown below. This will allow the trapped steam to escape, which will prevent extra moisture from condensing at the bottom of the muffins. Preheat the oven to 350 and line 6 cupcake wells with paper liners. In a mixing bowl, combine the dry ingredients. Then add in all the wet ingredients (no need to mix them separately) and stir well to combine. Bake for 25 minutes, until a toothpick comes out clean. Let cool before adding the frosting. To make the frosting, remove the coconut cream from the liquid below in the can. Use an electric mixer to whip the coconut cream with the honey and vanilla until fluffy. Store cupcakes and frosting separately -- the cupcakes should be stored in an airtight container at room temperature, and the frosting should be stored, covered, in the fridge. Re-whip the frosting after storing. Because I have been off refined sugar for many years, my taste buds are more sensitive to sweet things. I tend to lightly-sweeten my desserts, and many of you appreciate this. However, if you want these cupcakes to taste very sweet, you can up the maple syrup to ¼ cup and use the 2 Tbs. of honey in the frosting. Hi Lauren – I have enjoyed your blog for years! Thanks so much. I’m a LIOS grad and am very familiar with Bastyr. I just have one question – my husband follows a ketogenic diet and is allergic to gluten. Many of your recipes are suitable for him, except the ones that call for many eggs. I generally use flax eggs, but I’m wondering if you ever test your recipes with egg substitutes of any kind. Hi Marilyn! I imagine some recipes would work with flax sub but I haven’t tried it yet…. one thing regarding eggs… we realized one of our kids wasn’t tolerating organic pastured eggs and upon investigation, discovered it was the supplemental feed (organic soy or corn, or folic acid additive). So we’ve finally found a farm that sprouts some barley and feeds that to the hens in addition to their pasture rich diet — and that’s it. It’s a tough reality these days with just where the food comes from and how it was grown, treated, etc, even when it’s organic! If I want to double the recipe to make 12 muffins, do I need to double the eggs? Or can I get away with only using the 4?